Discover Solana Beach just north of Del Mar with Fletchers Cove Park. Reminiscent of a European side street, Solana Beach's ever popular Cedros Design District runs 2.5 blocks. Included below are homes for sale in Solana Beach. If you would like more information on any of these Solana Beach real estate listings, just click the "Request More Information" button when viewing the details of that property. We can provide you with disclosures, past sales history, dates and prices of homes recently sold nearby, and more. And, if you haven't already, be sure to register for a free account so that you can receive email alerts whenever new Solana Beach houses come on the market. Solana Beach lies on the west coast of California, in San Diego County. This city has a population of around 13,000 residents and covers an area of just over 3.5 square miles. A five Member City Council, one of which is the mayor, oversees Solana Beach. This city has a median household income in the low six figures, making it a moderately affluent part of San Diego County. The children in this community have the option to attend one of several public or private schools. The San Dieguito Union High School District and the Solana Beach School District oversee the public schools in Solana Beach. Solana Beach lies to the south of Encinitas, about 22 miles north of San Diego. The Spanish first colonized this area in the late 1800s, but it did not experience rapid growth until the years immediately following World War II. The area expanded again during a widespread real estate boom at the end of the 1900s. Many of the homes for sale in Solana Beach today were built during this time period. Solana Beach is sandwiched between two other fantastic beach communities, Cardiff by the Sea on its north side and Del Mar on its southern edge. The other town adjacent to Solana Beach - on its eastern side - is the unique little town of Rancho Santa Fe. This central location is ideal for those looking for a relaxing, luxurious atmosphere without the crowds found in the more tourist friendly communities. One of the most well known residential areas in Solana Beach is La Colonia de Eden Gardens. First established in the 1920s by the area’s farmers, La Colonia de Eden Gardens is one of the oldest communities in Solana Beach. In addition to its beautiful old homes, this neighborhood also includes La Colonia Park, a recreational area that is home to the oldest building in Solana Beach. Once a privately owned home, this historic building is now the site of the Solana Heritage Museum. A number of unique shops and restaurants can also be found within the borders of La Colonia de Eden Gardens. Prominently featured among these local businesses is the community’s selection of Mexican restaurants. Diners travel from all around the San Diego Metro area to eat at Don Chuy’s, Tony’s Jacal Restaurant, and Fidel’s Little Mexico Restaurant. Another great feature of Solana Beach is the Cedros Design District. This area is packed full of art galleries, antique stores, and the Solana Beach Farmers Market. The farmers market is open every Sunday afternoon, selling locally grown fruits and vegetables as well as freshly cut flowers. The vendors here also include local craftspeople that sell a variety of household objects and artwork. Fletcher Cove Beach Park embodies everything that is great about living in coastal California. This beautiful area is less crowded than some of the other west coast beaches, making it perfect for swimming, surfing, and kayaking. This family friendly area also includes a children’s play area and picnic tables - a wonderful addition to an already fabulous spot. The Lomas Santa Fe Country Club is located in Solana Beach on the western border of Rancho Santa Fe. When searching Solana Beach oceanfront homes for sale you will find single family oceanfront real estate in Solana Beach is located north of Fletchers Cove along the bluffs on Pacific Ave. Oceanfront condo complexes are located north of Via De La Valle and south of Fletchers Cove along the bluff. They are the Del Mar Beach Club, Del Mar Shores, Seascape Sur, La Playa Del Mar, Seascape Shores, Surfsong, and Las Brisas. The real estate in Solana Beach has appreciated steadily over the last few years. Today, the median home value in Solana Beach is about $1.15 million. The median list price per square foot is nearly twice that of the San Diego Metro average, making it one of the more upscale and affluent places to live in San Diego County, CA. The homes here start at around $500,000 for a smaller, 2 bedroom property with a backyard pool. The most upscale properties are located right on the beach, with the back patio overlooking the sandy shores and sparkling waters. These homes can sell for several million dollars, with the nicest properties going for upwards of $12 million. Solana Beach and its neighboring cities are a great place for a second home, vacation home, or primary residence. The perfect weather, friendly people, and vibrant, diverse entertainment options are sure to keep everyone’s whole family happy. 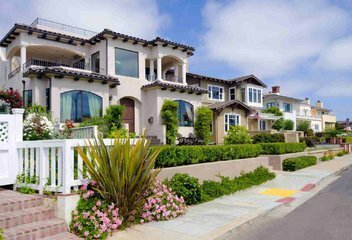 If you would like to learn more about the coastal communities in Southern California, continue to browse our website, check out the properties for sale, and read our informative community pages. Feel free to contact one of our helpful team members at Aumann Bender & Associates if you would like to take the next step towards buying or selling your San Diego County home. Isla Verde “green island” in Spanish, is a Lomas Santa Fe Country Club community of eighty seven homes in Solana Beach. Lomas Santa Fe completed their golf course and Isla Verde became for sale in 1968. Santa Fe Hills is a community of four hundred five residences developed in 1973.